Originally uploaded by one hot stove. On Saturday mornings I am in the mood for a proper breakfast, defined as anything non-toast/oatmeal/cereal. Today I decided to make Banana Pecan Walnut Pancakes, all the better to use up a banana which was slowly turning to syrup in my fruit bowl. HANDY TIP: Pancakes, muffins and smoothies are a great way to use up bananas that look too ripe to be eaten. In case you are pressed for time, an over-ripe banana can be easily peeled and frozen till you get around to using it. In short, there is no excuse for throwing bananas in the trash. 3. Combine contents of the two bowls and stir to mix. Don't overmix or the pancakes will not be as fluffy. 4. Make pancakes in a non-stick pan. They cook very quickly. 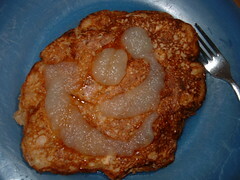 Top with applesauce and enjoy your Saturday breakfast! Hi Nupur, this is by far the best tasting pancake recipe i have seen. They come out super fluffy and unbelievably tasty. Thanks for sharing the recipe.